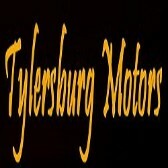 I looked everywhere for a nice, affordable truck before finding Tylersburg Motors, in Clarion county PA. I called and spoke with Burt who assured me that the truck was worth taking a 2 hour drive from Pittsburgh. I'm glad I took the trip! I got a beautiful; 4 wheel drive extended cab pickup that was exactly what I was looking for, was newly serviced and inspected, and priced less than trucks I had seen elsewhere. I recommend this dealership to anyone looking for a deal on a nice vehicle.